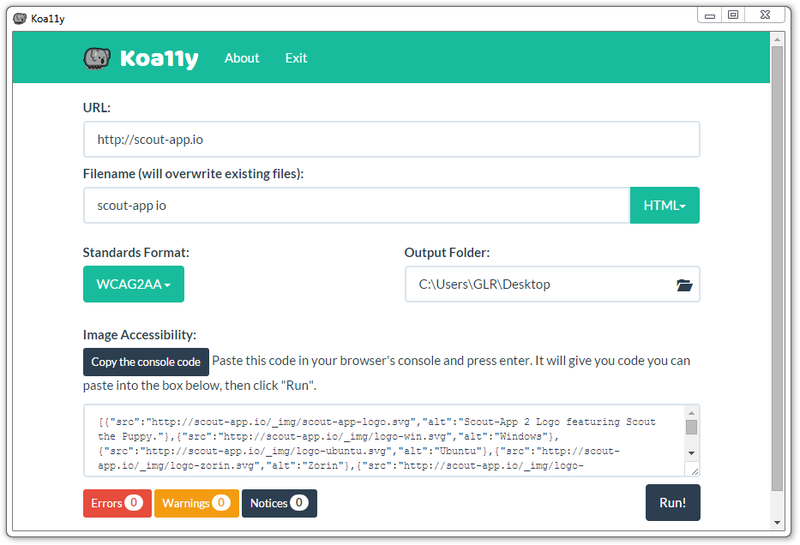 Koa11y is a desktop app that allows you to automatically detect accessibility (a11y) issues on webpages. View sample report generated by Koa11y. Koa11y is free and completely open source. OSX 10.6 and above (64-Bit only). Ubuntu 12+. Zorin 9+. Debian 8+. Other Linux versions, especially Debian based, may work but are not officially supported. Get a Koa11y sticker for your laptop. All profits go to the designer of the icon, Charlotte Schmidt. Koa11y was created using Pa11y, Vue.js, and NW.js. Log bugs and feature requests for Koa11y on the GitHub issues page. List of all Koa11y releases available to download. This displays the relative amount of downloads per OS as a bar graph. The Koa11y project was created as part of the Open Indy Brigade's Civic UX Group.